“There are two kinds of ZINASU-members. Those who attended the seminar and those who didn’t”. These are the words of Avoid Masiraha, national spokesman for ZINASU, the 2003 laureates of the Student Peace Prize. Nearly 12 years later, ZINASU and ISFiT still maintain close cooperation. Despite years of political decline, the student union is still a vibrant political force in Zimbabwe. 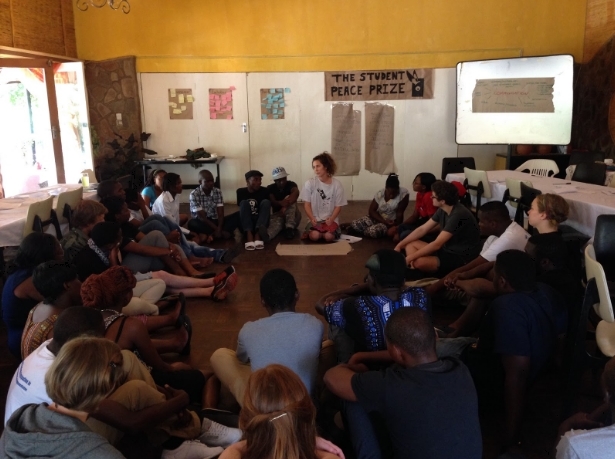 Early in January 2015, the Peace Prize Project team held a seminar for ZINASU in Zimbabwe. The intention with the seminar was to provide a platform for the members to discuss communication, working methods and security. Under no circumstances was The Peace Prize Project team to provide answers to the difficult topics discussed during the seminar, nor was this our intention. The Peace Prize Project rather sought to encourage the students in ZIANSU to exchange ideas amongst themselves. “The best thing was the interactive engagements, we were not taught, but given the tools to teach ourselves”- Joceelynn Hlimana. The seminar was focused on the core values of the Student Peace Prize; democracy, human rights and peace. The Peace Prize Project always seeks to promote these values. Our aim was to incorporate these values when discussing themes such as communication, working methods and security. We were very careful not to encourage any violent or aggressive approach to the challenges faced by ZIANSU. Creating a safe platform for interaction. The first day focused on teambuilding, where the goal was to create mutual respect and understanding. We found this necessary, as many of the participants did not know each other from before. Our aim for the day was to create a safe platform were the ZINASU members felt comfortable discussing difficult topics and exchanging ideas whilst respecting possible differences of opinion. On the second day of the seminar we discussed the importance of internal and external communication, information flow, image and precision in communication. While focusing on working methods, participants were encouraged to use the values of The Student Peace Prize in their approaches to problem solving. The aim of the day was to be creative and design effective campaigns. The assignment challenged ZINASU members to plan a strategic campaign aimed at increasing awareness and recruitment. The day was concluded with a network analysis activity where the ZINASU members interactively compiled a resource map, both for themselves as individuals, and for ZINASU as an organization. The theme on the last day of the seminar was security. We used a controversial case study which sparked lively debate concerning security. The participants were faced with a problem where they had to incorporate communication and working methods in order to solve the presented case, while keeping the issue of security in mind. The case study was used as an example on how all the different themes for the seminar are interconnected and depend on each other. Many of the participants seemed to embrace the ideas that originated from the seminar. As well as lively and serious discussions, we wanted the participants to have fun during the seminar. So-called energizers proved very popular and contributed to a relaxed atmosphere. “As much as it was educational, I also had fun. A lot of fun,” says Gender and Human Rights secretary Joanah Manombe. ZINASU President Gilbert Mutubuki is confident the seminar will leave a lasting impact on the organization; “This seminar will most definitely affect the future of ZINASU. The leaders partaking in this seminar will go back to their provinces using what they have learned and take the student movement forward,” he says.